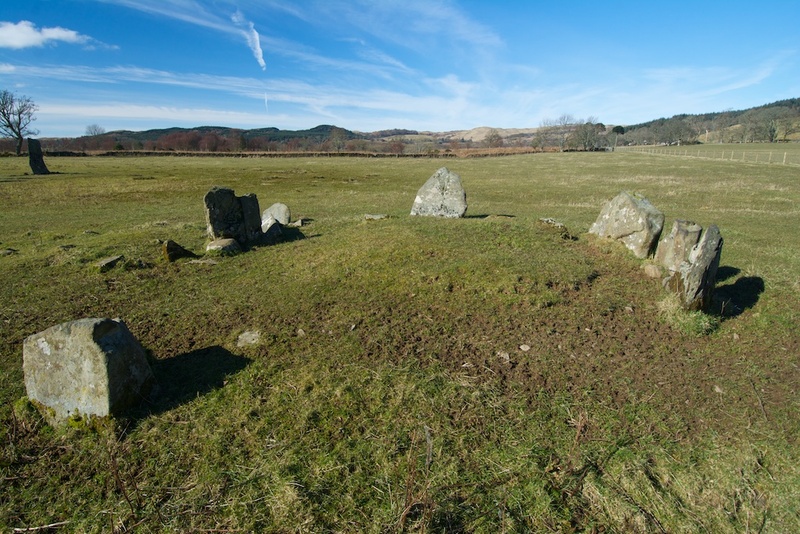 Kilmartin Glen is the most remarkable place, full of ancient sites such as Dunchraigaig burial chamber and the Nether Largie standing stones, guarded to the south by the hill fort of Dunadd. 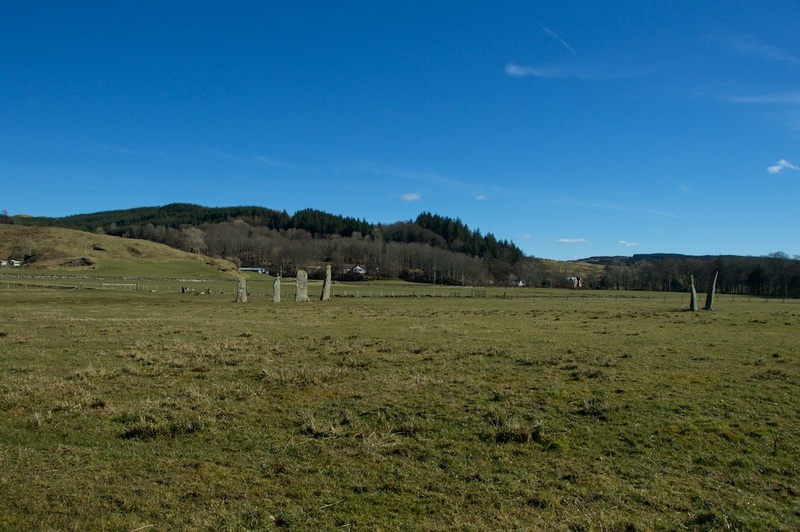 I’m now going to show you a few more sites, starting with this impressive stone row at Ballymeanoch. 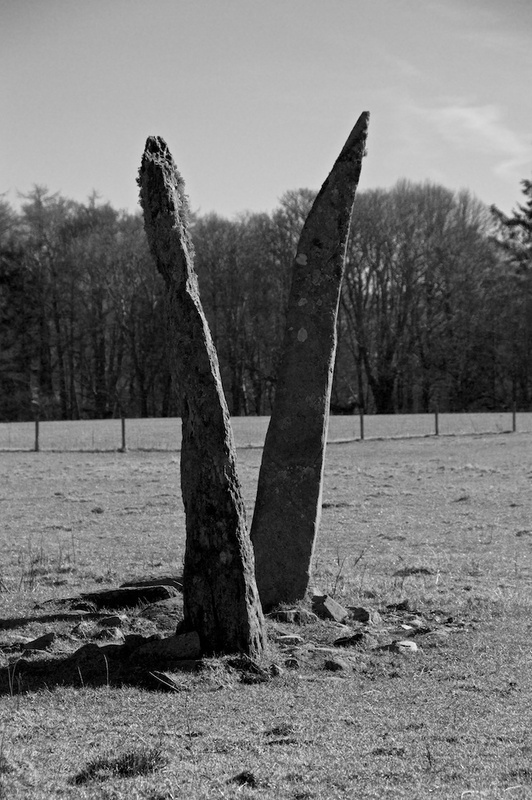 The stones appear almost out of nowhere, blending into the field from a distance and then rising up in stark profile against the sun as you get closer. There are six stones in all, set in relatively straight lines of two and four which are aligned approximately north-west to south-east. The tallest is 12 feet high, and some of the others must be approaching this height; up close, they have quite a presence. I’ve visited quite a few circles and rows, and sometimes they strike me as ‘masculine’ or ‘feminine’. Ballymeanoch seemed distinctly feminine, and to me there seemed to be quite a joyful ‘fizz’ in the texture of the stones. 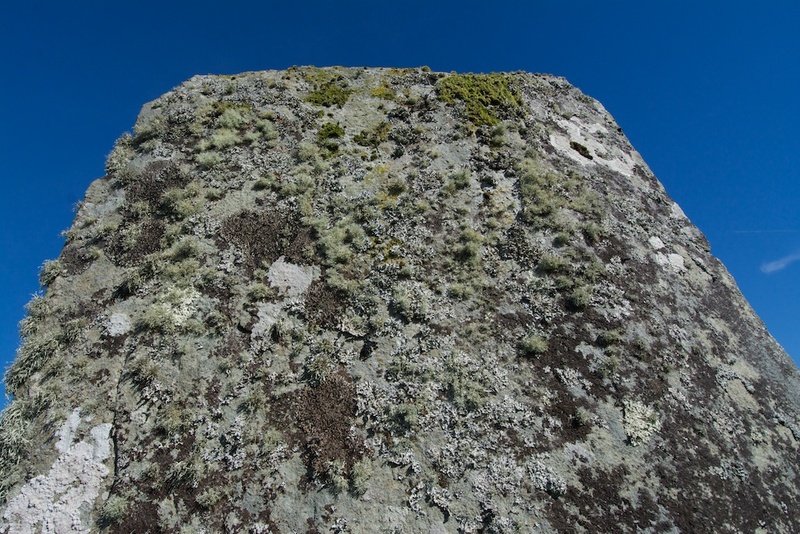 When I went round to the south side of the four-stone row, I was thrilled to see the rich ‘gardens‘ of lichen that each one has growing on its face. What a profusion of feathery green and silver, thriving on a surface that has stood to welcome the sunrise for thousands of years. 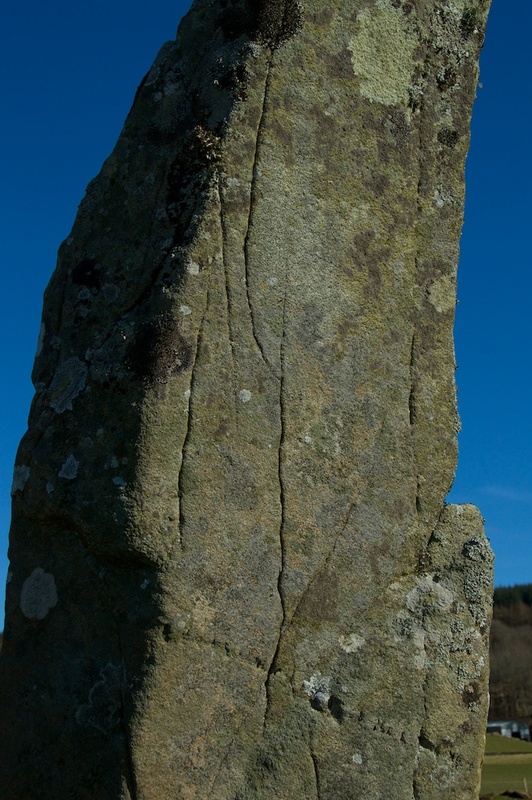 The two middle stones are riddled with cup-marks, difficult to see unless you catch the shadow. One of the others was curiously lined, although whether these lines are man-made or natural is open to interpretation. Cremated human bones were found in the pit where the pierced stone had stood; they date from between 1370 and 1050 BC, and the RCAHMS considers that they were “probably buried as a foundation deposit when the stone was erected.” After the stone fell over, the broken fragments were moved nearby, and I may have stumbled across the pierced section without knowing what it was. About 20 yards or so from the stone rows (and very close to the pierced fragment) is a kerb-cairn consisting of about 10 smallish slabs set upright in a rough circle, with a mound of grassed-over rubble or stones in the centre. There’s nothing to say how many stones would have stood here originally, and I can find no record of a burial. 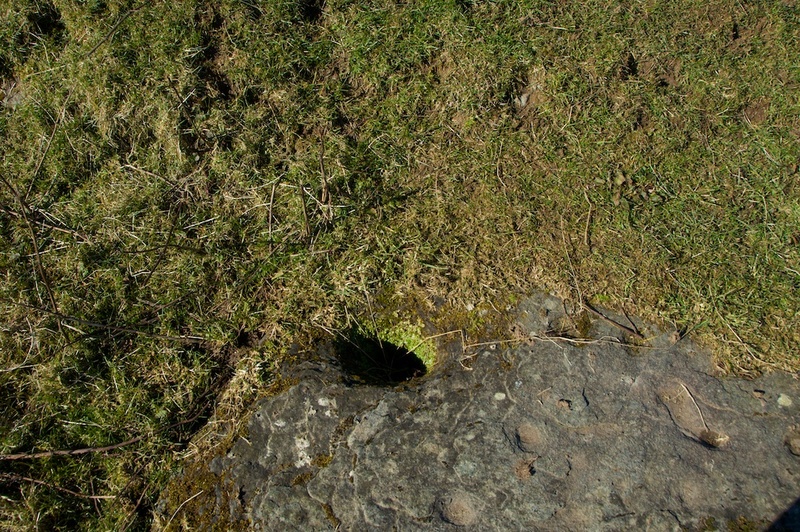 One source suggests a date for the kerb-cairn of between 1400 and 1200 BC. 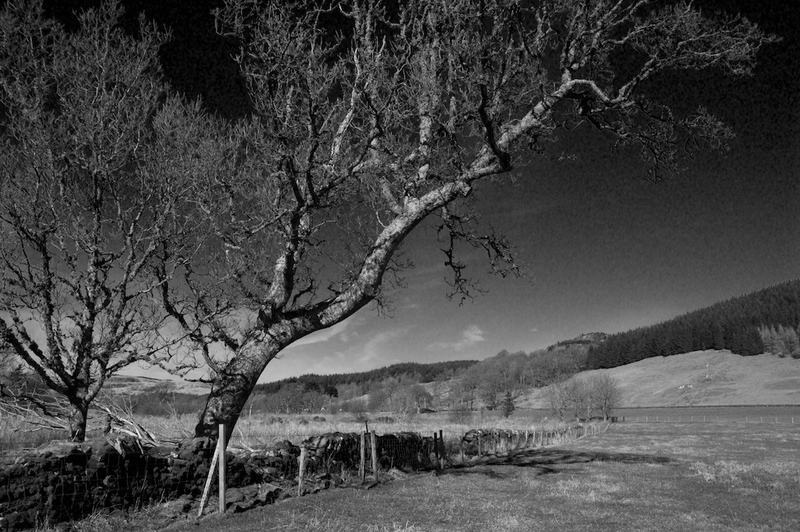 On the northern boundary is an old tree – most likely an oak – which has contorted itself into an interesting shape, as if it’s reaching out towards the stones. It still has a long way to go, but it’s making a valiant effort. 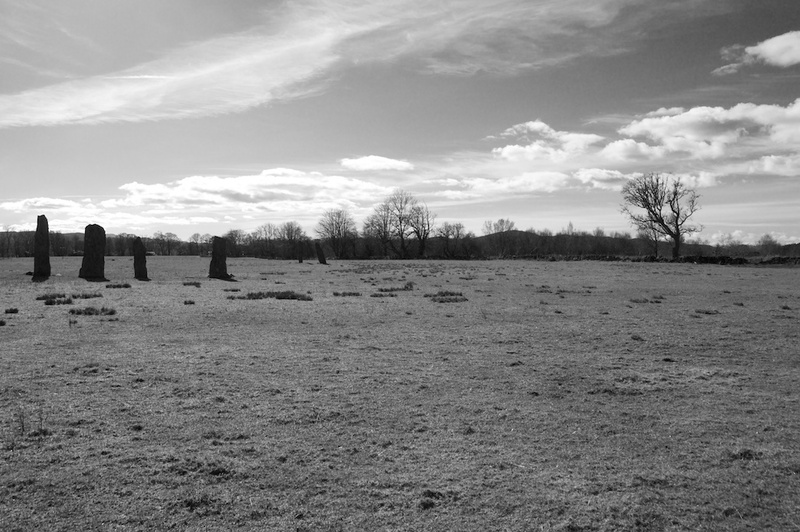 Kilmartin is a spectacular place, but it feels reassuringly unchanged, so that you can still feel the undisturbed ancient peace beneath your feet. It’s dream-like on a windless sunny day, but beautiful in all weather: check out my earlier features on Dunchraigaig and Nether Largie to see for yourself! 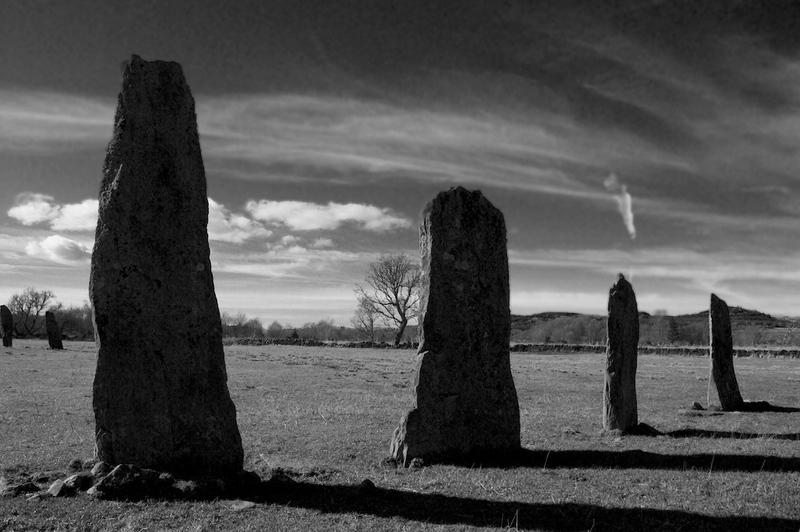 Deservedly called ‘Scotland’s Richest Prehistoric Landscape’, Kilmartin lies about 30 miles south of Oban in Argyll. 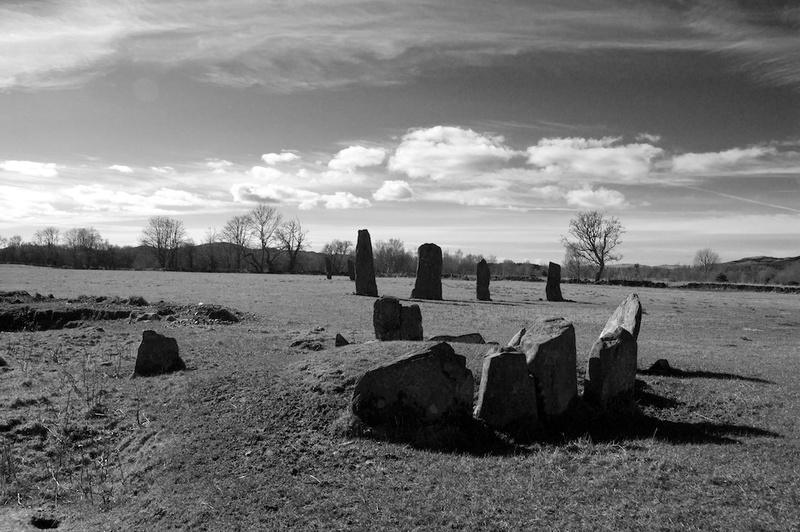 Kilmartin Museum contains many artefacts and relics found in the Glen, and is well worth a visit. Thank you very much, Ian! 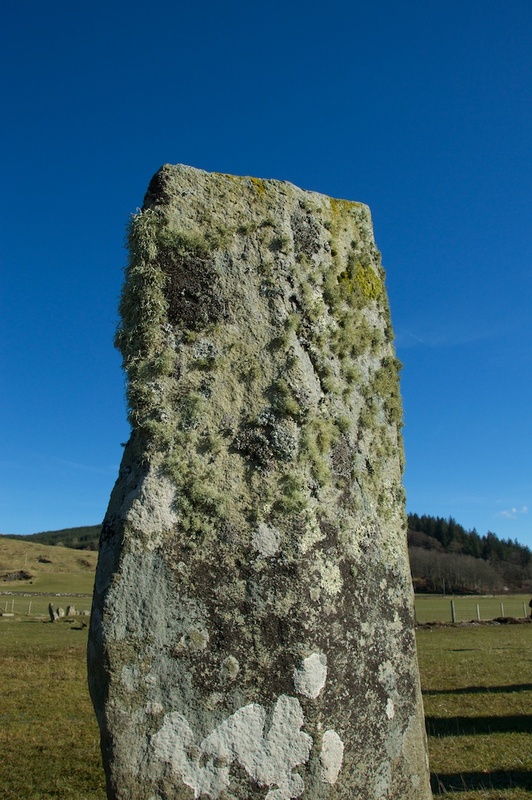 Have you visited Kilmartin yourself? Thank you, Lorna! They seemed to work quite well in black and white this time, because of the contrast. Haha, maybe I’m being fanciful, but as I’ve said before, I’ll probably end up being “the old woman who talks to the stones”! Thanks, Jessica. Kilmartin is such a special place! Being an old woman talking to stones doesn’t sound all that bad to me. 🙂 Really like your use of black and white. But especially like that you’ve included the color shots, also. Each highlights different aspects. Well done, Jo! Thanks, Pat! 🙂 Glad you think so! Glad also you liked the b&w. It was the contrast that made me think about it. I always enjoy your posts but I am particularly interested in these kind of sites. Fascinating! Well researched and photographed as usual. Thank you. Thank you very much, Jane! I love these ancient sites, too. You can probably tell! 🙂 I’ve been wanting to explore Kilmartin for a long time, and I’ve still only scratched the surface. So do I, Viv, and the lichens are a true testament to the air quality. A very special place. 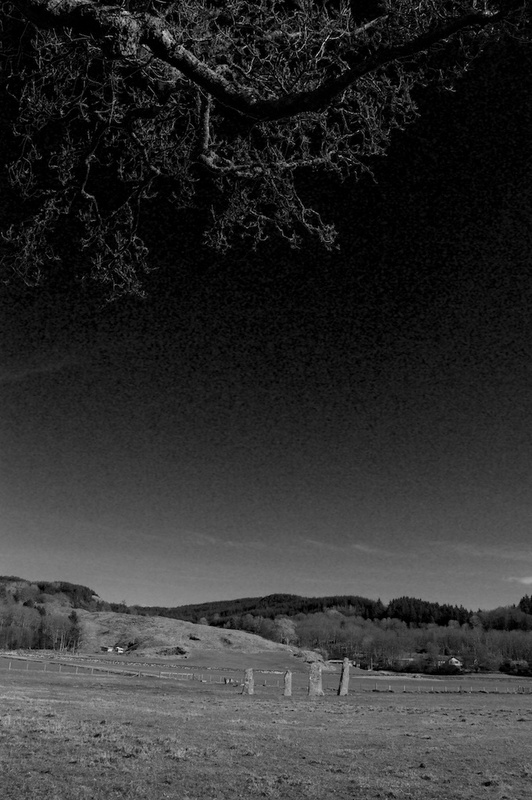 Kilmartin is a special place, Lynne, as you know! Time doesn’t seem to exist there. I have yet to get to the church to see the carvings! Stunning. I’d never thought about the male/female thing before. Thank you – yes, it’s interesting, isn’t it? I realise it’s a very personal thing, though, and everyone’s response is different.